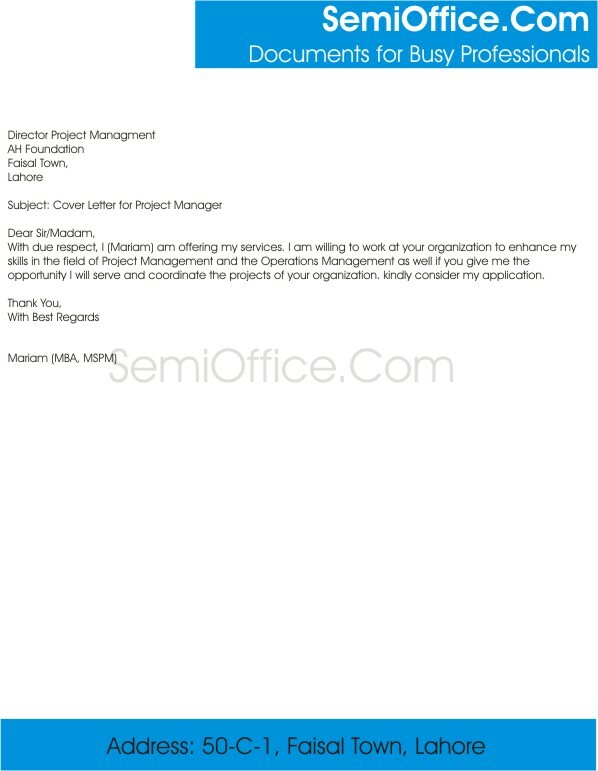 Sample cover letter for project manager job or sending resume to construction or other company for job or internship. This job application for project manager is best for trainee project managers. Sample job application for project manager. I watched your job advertisement on website/newspaper. I am well qualified Electrical Power Engineer and applying for the post of Electrical Power Engineer having work experience of two years in power industry and projects. I can efficiently perform tasks and lead teams of technicians and skilled workers. I have completed power distribution projects in international companies and accomplished tasks within given time. As far as this job is concerned I am fully eligible for the post in your company. I am looking forward for formal interview and discuss about specific job. I hope you will consider me for the post in your company. With due respect, I (Mariam) am offering my services. I am willing to work at your organization to enhance my skills in the field of Project Management and the Operations Management as well if you give me the opportunity I will serve and coordinate the projects of your organization. kindly consider my application. I’ Ayesha writing in response to your job advertisement for the position of Housing Project Manager at Behria Town. I have five years of experience as assistant project manager at Ghousia Builders and masters in projects management from University of London. I have proven myself a great team leader and earned number of achievements during my current job and educational life. All the educational, professional experience and achievements certificates are attached for your review. I request you to please give me a chance to present myself in an interview.